The success of Hulu’s The Handmaid’s Tale adaptation and ABC’s Roseanne revival would suggest that timeliness is next to godliness. The former has raked in the accolades with its deft, often merciless exploration of Margaret Atwood’s dystopian themes, while the latter scored the highest-rated sitcom premiere in years, thanks in part to (and in spite of) its star’s vote for the ongoing constitutional crisis that is the current president. But the shows also prove that topicality alone doesn’t guarantee ratings or awards; Bruce Miller’s drama also features exceptional acting, writing, and directing, all of which are lacking in the 10th season of Roseanne, whose viewership has been slipping every week since the premiere. 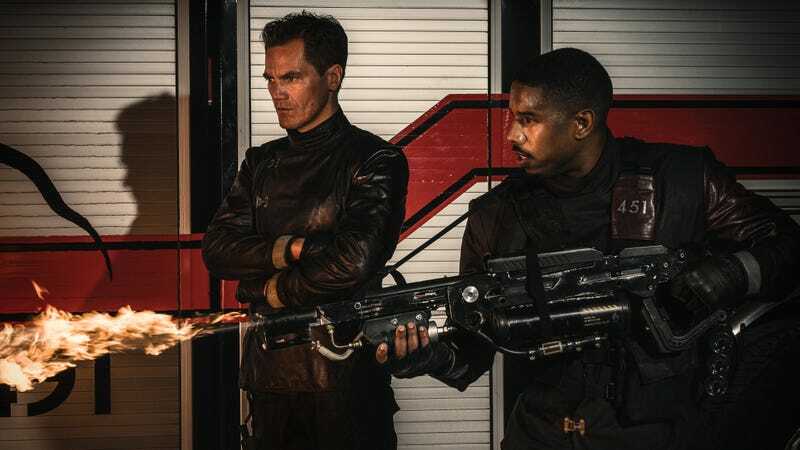 On the surface, HBO’s Fahrenheit 451 adaptation seems poised for the same greatness as the Hulu drama. The source material is Ray Bradbury’s classic sci-fi novel about identity, censorship, and anti-intellectualism, along with a healthy dose of technoparanoia. It couldn’t be more suited to our times, what with our state-sponsored media, privacy violations of heretofore unseen magnitude, and some off-base connotations of the word “elite.” Director Ramin Bahrani, who co-wrote the script with Amir Naderi, has made his career on socially conscious films like Chop Shop and 99 Homes, which manage to find empathy for even their ostensible villains. Then there are the two leads, played by Michael B. Jordan, who is just on fire these days, and Michael Shannon, who has an unmatched ability for depicting zealotry. But as the film unfolds, it’s hard to escape the feeling that it’s been tailor-made to tap into our fears and indignation. Bradbury’s novel has had cultural resonance since it was first published 65 years ago, its subject matter both censored and taught in schools. The structure of this latest reworking mirrors that of a classroom lesson, complete with question-and-answer sessions, including one with schoolchildren. This Fahrenheit 451 is a prosaic reimagining, one so hell-bent on reflecting the present that it can’t be bothered to reach further back than the last season of Black Mirror and the Blade Runner sequel for its design. Jordan stars as Guy Montag, a hotshot fireman who’s risen to the level of Master Trooper under the brutal tutelage of Captain Beatty (Shannon). In addition to reflecting contemporary concerns, Fahrenheit 451 tracks Montag’s awakening, which is sparked by the passion of the rebels (or “eels,” as in “illegals,” presumably), who are willing to die for intellectual freedom. The movie departs significantly from the book, which wouldn’t be an issue if it didn’t undermine Montag’s development. Gone is self-medicating wife Mildred (Laura Harrier was cast, then cut from the movie), whose obsession with her “parlor wall family” represented Bradbury’s fears that mindless entertainment like TV would replace literature as art. It’s a testament to Jordan’s abilities as an actor that he’s still able to demonstrate Montag’s shift from automaton to firebrand, without the lifeless home life. There’s some genuinely inspired imagery, especially toward the end of the film, which is, rather counterintuitively, one of the few times the storytelling shows much restraint or nuance. Jordan’s and Shannon’s performances elevate the writing, as they take turns questioning the power and pain of knowledge. But this Fahrenheit 451 isn’t interested in a controlled burn. When the firemen, who torch books and homes to “protect” the nation from thinking too much, chant, “Make America burn again,” that little pre-conflagration ceremony isn’t chilling, it’s silly. There are equally clumsy references to fake news, so-called outrage culture, and fears of overmedication, which capture the inelegant way the filmmakers have reinterpreted Bradbury’s work. They’ve converted subtext to text, then put it all on screens the size of actual skyscrapers, which might be one of the subtler nods to Trump in their repertoire.